If you are using WPF, you are more than likely using Expression BLEND to. You may even be one of the lucky ones and have a designer as part of your team. If you do you may be aware of the whole designer/developer workflow and just how important this has become. The idea being that XAML/Binding (and MVVM I would say) have now allowed a designer to work on the same project as the developer. Whilst the developer may be coding away the designer can be polishing up the UI to look fantastic. This is all cool. But sometimes the designer will need some help in certain areas. Design time data is one of these areas. This is especially useful when the designer is trying to create DataTemplates that may be applied to a List of items. Without design time data the designer simply does not know what their design efforts will yield at runtime. It is true to say that there has been a lot of work around this area done in Visual Studio 2010, but I have always used a dead simple approach. There are many different ways, for example you could have something like a ViewModelLocator which stores view types against some other type. The other type could be an actual ViewModel or some design time mock object. For me I like to keep it simple. I have 2 attached DPs, one for the real ViewModel and one for the design time ViewModel. It is dead simple if you are in design time use the design time one, if you are not use the actual one. /// Gets the DesignTimeViewModelType property. /// Sets the DesignTimeViewModelType property. /// Gets the ViewModelType property. /// Handles changes to the ViewModelType property. Then I have 2 ViewModels, one is the actual one, and one is the dummy design time data one. 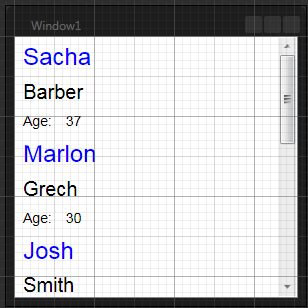 NOTE : In this example I also show off a ListBox with an example DataTemplate for Person objects. Every once in a while something happens in conversation, and someone says something that may prove useful. The other day was one of those days, a bunch of us WPF Disciples were having a chat with Glenn Block (Patterns & Practices / MEF), about some mad arse scheme he had for getting rid of INotifyPropertyChanged smell. Anyway the result was that Glenn told us about a rather useful class in the .NET 4.0 base class library that made it easy to work with a collection of weak reference objects. Now I donâ€™t know how many of you are familiar with WeakReference and or WeakEvents, or even the idea of Weak anything. Itâ€™s kind of a hot topic these days to allow object references to be maintained without a strong reference to an object, thus allowing objects to be garbage collected. Which is kind of a nice thing. Anyway the long and short of it is sometimes it is advantageous to use WeakReferences instead of strong ones. It does not persist keys. That is, a key is not kept alive only because it is a member of the collection. It does not include all the methods (such as GetEnumerator or Contains) that a dictionary typically has. It does not implement the IDictionary(TKey, TValue) interface. The ConditionalWeakTable(TKey, TValue) class differs from other collection objects in its management of the object lifetime of keys stored in the collection. Ordinarily, when an object is stored in a collection, its lifetime lasts until it is removed (and there are no additional references to the object) or until the collection object itself is destroyed. However, in the ConditionalWeakTable(TKey, TValue) class, adding a key/value pair to the table does not ensure that the key will persist, even if it can be reached directly from a value stored in the table (for example, if the table contains one key, A, with a value V1, and a second key, B, with a value P2 that contains a reference to A). Instead,ConditionalWeakTable(TKey, TValue) automatically removes the key/value entry as soon as no other references to a key exist outside the table. And here is what we get as output when we run this little demo project. That is quite a handy class, donâ€™t believe me. Try and write your own messager and tell me different. 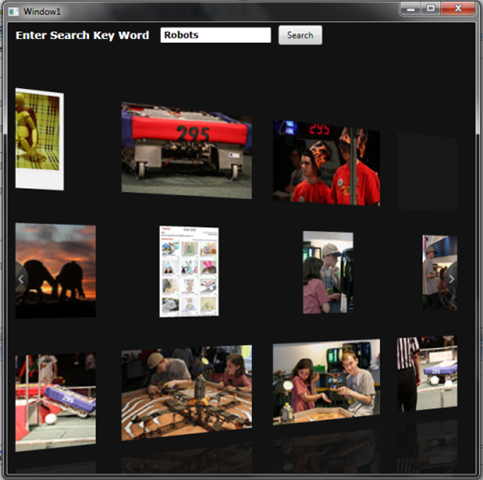 I have always been amazed at just how cool the CoolIris PicLens browser addin is. Its really really cool, top drawer in fact. The other day I was wondering if there would be an API or way that I could use this in my own app, after all I could host something in my own HTML page within a WebBrowser control, which itself is hosted inside my own WPF/WinForms app. And here is a small screen shot of the demo application that I built running (this is WPF, but the article could easily be applied to WinForms). It is a very small article, but I think it is quite a compelling one, just because PicLens is so awesome. I have been quite for a little while, but I have been working silently on a new article, which is something that I quite like. Basically I have created a rather unique WPF Breadcrumb system, that supports live preview of the crumbs visited, and is very easy to use in your own projects, and it also supports multiple transitions when changing between crumbs. Here is a small video showcasing the articles code. Some of you may not know but I have just under 2 weeks now until I have my 1st child (boy) so this article will be my last one for a little while, so if you have read some of my previous posts or got enjoyment from this blog or learned something from past articles / blog posts, it would be really ace if you could spare the time to vote for my article. I am dead proud of this article, and I have to say it would be rather nice to go into a restful state (at least for a month or so), going out on a high. So if you feel inclined to vote for my new article, that would be nice. 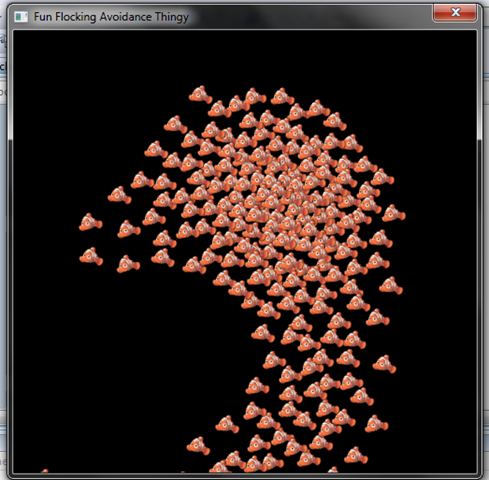 I have had a couple of people that have asked me how to draw fast running simulations / games in WPF. The thing that most people try and do is use controls, and move them about using RotateTransforms and TranslateTransforms. This does sound good in theory, but I just donâ€™t think itâ€™s fast enough. You know if you are writing a game or some sort of physics thing you need speed, and the best way to do that is to do it OnRender. Using this override we are easily able to perform quick running graphics operations. 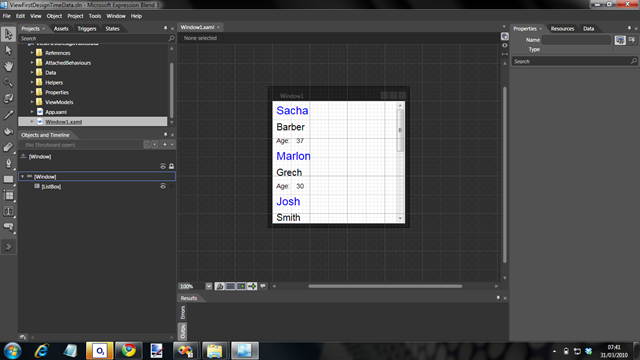 To demonstrate this I have create a small boids type flocking panel, where the user may choose fish or butterfly icons. The fish/butterfly will flock together and tend to hover around the centre of the containing panel, but will be scared shitless of the mouse and shall do everything they can to avoid it. In order to do this we will need to know how to use the DrawingContext to do quick operations such as Rotates/Translates. directly onto the DrawingContext, which makes it very very fast.